Saturday I had the pleasure of installing Sisterlocks on a young lady that is the sister of a group that I admire as well as enjoy the bangin reggae melodies. It was crazy! We just laughed all day of the install. We watched movies. We toasted to her birthday. This was one of the most chill and laid back installs that I have installed. She remarked how painless the process was and how quickly I completed the job. 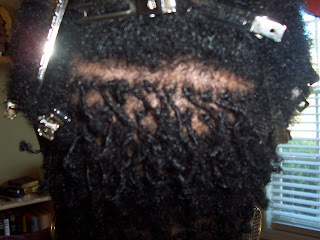 Any length under 4 inches I really try to finish in one day. After we completed her install I dropped her off to her home where I had the pleasure of meeting her sister who is a member of the band. Now yall know I had to try to play it real cool right. I kept thinking in my mind...Don't act groupie, Don't act groupie, Don't act groupie. Her sister was so COOL! She wants her hair done as well. I gave her a in home consultation and she scheduled her appointment for June 27th. I will provide you all with picks and her name when we complete her install. Until then you all will just know her band has several albums out and all 5 of the members are independent artists who are the children of a famous reggae artist. Pers no cheating you already know the band!! Here are the pics of the install I did on Saturday. The first step to curing your addition is to admit it. Today my hubby admitted that he was indeed a pack rat. Yes Blog Fam...my hubby hoards things from decades past in the back of our closets to never be seen again. As I am planning our closet organizing through California Closets I noticed some strange things in the back of our master closet. 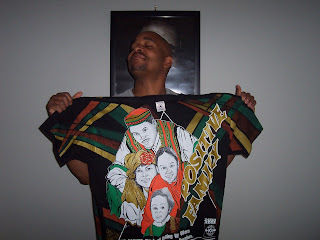 I looked back there and I picked up a wool Kwanzaa type vest. Oh my Jesus! Not just one but 3. One was a size 3 X... WTH!! 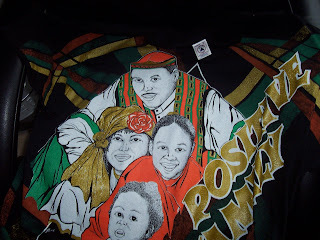 My hubby has never been that size but back in the 90s he would wear his clothing so big that it would drive me bonkers. I went off!! DUDE...you need to clean out this junk immediately. No w my hubby not only has clothing in our master closet but he has two bedroom closets as well. I just have my clothes in the master closet. Do you know he went through those closets today and he unloaded two trash bags full of 90s gear. I couldn't believe it. Just to prove my point I took a picture of one of his treasured shirts. Notice the Red, the Black, and The green with the Key Sissies. Yall remember that from the X Clan days. Well this bad boy was hanging in the closet just a chilling. He did admit that he needs to do a better job of eliminating clutter. That's all I wanted to hear. Now if we can get him on a quarterly schedule like myself we will realize more space. God has been really good to me. When he takes clients away for one reason or another he always brings more clients to replace them. 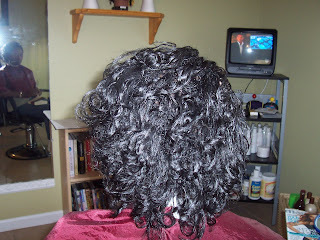 I am finding that he is bringing me shorter hair clients as well as clients transitioning from the relaxer. Relaxer has done such damage to the hairlines of some of my clients that it seems like all hope is gone but let me tell you we are seeing GROWTH baby all over the place. During their first retightening we are seeing new hair everywhere. 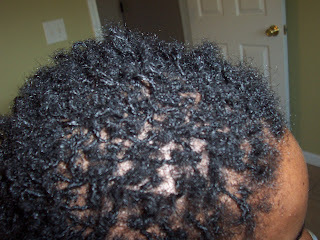 I just love the vitality of natural hair. 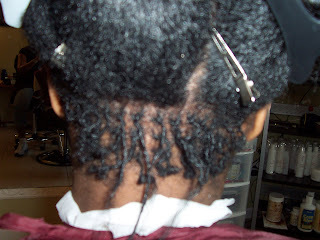 Here is my newest Sisterlock Client. 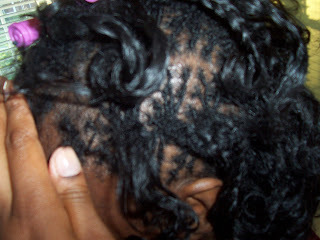 I loved working with her hair. 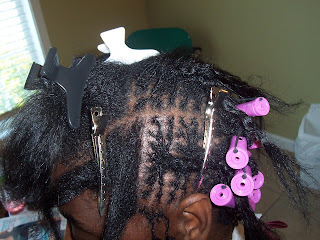 She had such thick, lush hair with relaxer on the ends. 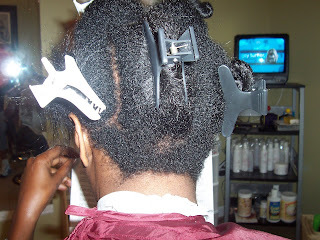 She had 2 to 3 inches of natural hair and maybe 7 inches or so of relaxed hair. 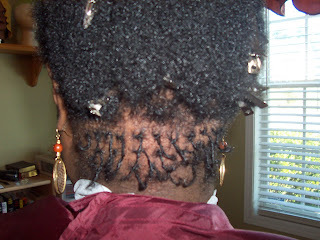 Her natural hair took to the Sisterlock pattern with not one problem. All of the test locks stayed put. It was a great install that lasted maybe 12 hours with a one hour break. You can't even really see her parts her hair is so thick and lush. See the finished product above.